Texas brown tides result from blooms of a microscopic alga called Aureoumbra lagunensis. The individual algal cell is only 4-7 microns in diameter, which means that over 200 brown tide cells sitting side by side would stretch across the period at the end of this sentence. When concentrations of this alga reach 1-2 million cells per milliliter of water, the water appears brown, taking on the color of the alga and thus the term “brown tide.” Brown tide can withstand a wide range of salinities and temperatures, though it does best in warmer temperatures, and has very few natural predators. This species is unique to the Gulf of Mexico and was first noted in the Laguna Madre, the hypersaline bay that stretches 120 miles from Corpus Christi to Port Isabel. It has been found in Florida and Mexico. Some researchers think that brown tides are part of a natural cycle within the Laguna. Brown tides are patchy by nature and are often moved around by winds. Therefore, an area that is murky in the morning might be clear by the afternoon. 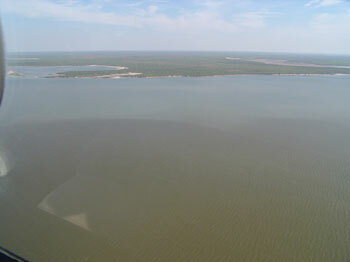 The Laguna Madre is the most productive bay system in Texas, producing more fish than even Galveston Bay. It is vital habitat for fish, as adults go there to spawn and juveniles use the seagrasses as nursery grounds. Nearly all of Texas’ seagrass meadows are in the Laguna Madre. In dense enough concentrations, and over a period of months, brown tide can kill seagrasses by blocking out the sunlight they need to survive. In addition, numbers of zooplankton (small floating animals, such as amoeba, that serve as food for many organisms) decline during brown tides. There is no evidence that brown tide poses any harm to people. Research has shown that, though brown tide apparently has no effect on juvenile or adult fish, it can be deadly to fish larvae under certain conditions. It is not known whether this is a direct toxic effect, or is due to changes in water quality associated with high cell numbers. Drs. Tracy Villareal and Ed Buskey, researchers at the University of Texas Marine Science Institute in Port Aransas, were awarded a Rapid Response Grant through the MERHAB program of NOAA. The Laguna Madre was home to what is believed to be the longest continual algal bloom in history, from 1990-1997. In late 1989, a brown tide originated in Baffin Bay and was discovered by researchers with the University of Texas Marine Science Institute (UTMSI) in Port Aransas who were taking routine water samples along the entire length of the Laguna. At the time, the organism responsible for the bloom was unknown to science. It was given the name Aureoumbra lagunensis, meaning “the golden shadow from the lagoon,” in a paper written by Hudson DeYoe of the University of Texas - Pan American. Though it is not known what factors led to the bloom, a number of events preceded it. A hard freeze in December 1989 killed a massive number of fish as well as some invertebrates, some of which feed on brown tide. The area was in the midst of a 2-3 year drought, which caused the salinities in Baffin Bay to be higher than normal. High salinities are lethal for many organisms, so some began dying out, lowering the bay’s diversity. This resulted in a disturbed environment. Brown tide was left without its natural predators, and the decomposition of organisms killed in the freeze introduced large levels of nitrogen into the bay, perhaps acting as a sort of “fertilizer” and allowing the brown tide to bloom out of control. During the last bloom, researchers at UTMSI looked back at their water samples taken from the Laguna before the bloom and discovered that the alga was present as far back as March 1989, though in low concentrations. TPWD wishes to thank Tracy Villareal of the UT Marine Science Institute for his editorial input on the brown tide portion of our website.